STericcson was founded in the year 2009 as a joint venture by ST Microelectronics andEricsson. Head quarter is at geneva. The industry type is semiconductor and also wireless technologies. ST-Ericsson is unique in its ability to deliver state-of-the-art platforms, integrating mobile multimedia and connectivity for GSM, EDGE, WCDMA, HSPA, TD-SCDMA and LTE.ST-Ericsson is innovation-focused with the vast majority of its employees working in research and development. The company is backed by the strongest Intellectual Property Rights (IPR) portfolio in the wireless industry through its parent companies – Ericsson and STMicroelectronics. Goto ST ericcson home page. At the top of the tab click careers. In careers page,on the left side bar ,choose careers contact. All can create job account in Sweden website and I have created job account from Sweden website stepstone.While creating job account translate Sweden language to your own language. 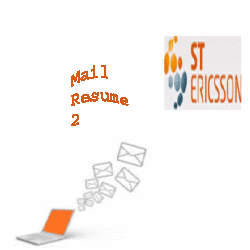 ST Ericsson recruits for the positions of administration ,Computer and IT,Economy,Banking finance and insurance,Design and architecture,Sales and purchase,Human Resource,Industry. Handicraft and services,Culture and Art,Media and information ,Public Administration,Security and Protective Services,Transport and Logistics,Research and development,Hotel ,Restaurant and tourism,Health Care,Law ,Marketing,Environment and Animal care,Organization and management,Technology and engineering ,Education. The technologies of ST-Ericsson are connectivity,mobile computing,modem technologies,multimedia,operating systems ,packaging,power and energy. Some of the products of ST-Ericsson Nova smartphones and tablet platforms,Application processors,modems,2G and 3G platforms,enhancements such as audio DSCS,codecs,Video interfaces ,power hub,Gps ,bluetooth ,Fm,USB solutions and Wi-Fi solutions.